When it comes to watches – as with so much else in my life – I’m conflicted. I am attracted to horology for its rich history and (unfortunately ever-declining) use of traditional skills and crafts. There’s something appealing to me about the fact that there is little difference between the mechanics of a modern wristwatch and the pocket watches Abraham-Louis Breguet and his contemporaries were making 200 years ago. In fact, just as many of the best watchmakers today learnt their craft by repairing and restoring watches and clocks that are hundreds of years old, by the same token I think that the best watchmakers from centuries ago would have little problem repairing and restoring most of today’s watches and clocks . . . at least those that are silicon-free. I’m all for evolution, especially continual evolution in watchmaking. And that’s certainly worked well for Rolex. However, from time to time we need revolution as well as evolution, and the former is severely lacking. We often see brands harping on about some “revolutionary” new improvement or technology, but most tend to be more effective as “improved marketing messages” than leading to truly better chronometric or functional performance. And for all of the brand’s claims of being a disruptive force in the staid world of watchmaking, MB&F hasn’t really rocked the boat very much at all when it comes to “real” watchmaking. Watch design, yes, but MB&F’s watchmaking has tended to serve the requirements of its wild case architecture rather than contributing anything new to traditional watchmaking. And, to be fair, the brand has never claimed to offer anything more than (very) contemporary design based on traditional watchmaking. MB&F’s Horological and Legacy Machines have been visually sensational with interesting movement architecture, but the brand has been more like an enthusiastic yoga teacher, seeing how far and in how many positions traditional watchmaking can be cajoled rather than adding anything horologically substantial to the field. MB&F creates better-looking mousetraps, but doesn’t really invent better mousetraps (and, in general, neither does anyone else). With Legacy Machine Perpetual MB&F, in collaboration with Irish watchmaker Stephen McDonnell, has not simply reinterpreted the perpetual calendar complication, one of the most time-honored (and complicated) of traditional complications. It has reinvented it to offer trouble-free use and fantastic aesthetics. McDonnell is an Irish watchmaker/movement designer that has been a Friend of MB&F since the beginning when he was instrumental in finalizing the development and construction of Horological Machine No. 1. While LM Perpetual looks to all intents and purposes like one of the least radical timepieces created in the brand’s ten-year history, make no mistake: it is revolution not evolution. Whereas in previous MB&F Machines (and most watches in general), the movements are developed to serve the requirements of the designs, for Legacy Machine Perpetual it was the movement itself that dictated the design. The main problem with the vast majority of perpetual calendar watches is that the mechanisms are so easily damaged. And with such a complex complication, the slightest problem usually requires a long and expensive trip back to Switzerland for repair. In the watch world, perpetual calendars are with good reason often referred to as “boomerang” watches because they keep coming back to brands again and again for service or repair. Problems with perpetual calendars generally occur when the time or calendar indications are adjusted (or attempted to be adjusted) while the mechanism is in the process of changing display, which is usually a few hours around midnight. This is because traditional perpetual calendars, which keep track of how many days there are in each month, including the 29-day in February in (most) leap years, work from a default month length of 31 days and simply fast forward through the surplus days in shorter months (around midnight on the last day). So in a month with 30 days, at changeover the mechanism will briefly show “31” as it moves toward the first of the next month. In February, it will pass from 28 to 29 to 30 to 31 before arriving at March 1. And any manipulation of the time or date during that changeover can have serious and expensive consequences. What McDonnell came up with was a system that takes a default month length of 28 days, which adds days as required. So each and every month will have its exact number of days. At the end of the month, it will immediately change to the first of the next without passing through obsolete dates. To ensure sure that nothing can go wrong even in the short period of time in which the mechanism is changing, McDonnell incorporated a fail-safe system that deactivates the date correctors whenever there is a risk of damage so that the user cannot mistakenly damage the movement. To control the complexity of tracking and displaying the exact number of days in each month and leap years in the Legacy Machine Perpetuel, McDonnell invented a “mechanical processor” to replace the grand levier (big lever) mechanism that is at the heart of traditional perpetual calendar mechanisms. 1. It allows a quick adjustment of the years independently of the months, unlike traditional perpetual calendars where the user must change the years in the four-year leap year cycle by setting through up to 47 months. 2. It allows dispensing with a full dial. With the traditional perpetual calendar system, any supports for a dial or subdials within the perimeter of the complication would block the movement of the grand levier, so stand-alone subdials were not an option with traditional perpetual calendars. Oscillating on high above the dial is the atypical suspended balance that, together with the round case, defines the MB&F Legacy Machine collection. But because the perpetual calendar complication fills all of the space on the dial side, the escapement that the balance wheel regulates is on the back of the movement, adding animation to the view through the display back. The whole perpetual calendar complication is then visible on top of the movement mainplate, covered only by the absolutely minimalist subdial rings for the calendar indications. Those subdial rings appear to float above the movement underneath thanks to cleverly designed, concealed supports. The very first thing that McDonnell and the MB&F team had to verify before any work started on developing the complication and movement itself was that what is quite possibly the world’s longest balance staff − which connects the balance wheel above the dial to the escapement under the movement − was a horologically sensible and reliable option. Luckily, it proved to work just fine. It should be pointed out, if not stressed, that Legacy Machine Perpetuel features a fully integrated movement. Unlike the vast majority of perpetual calendars, which are modules fitted to existing movements, the movement of LM Perpetuel was developed from the ground up just for this specific model. To put that in context: the development of even a relatively simple movement by a large, deep-pocketed brand is a big deal. A small brand developing its own movement (even a simple movement) is a major undertaking requiring scarce resources, time, people, and money. For a niche brand − especially one as small as MB&F − developing a complication such as a perpetual calendar is virtually unheard of. Especially when we are not just talking about a perpetual calendar module, but a completely integrated movement. And then add to the mix that MB&F has not “simply” developed its own variation on the traditional perpetual calendar, but one with a completely new type of mechanism: one never done before and one with no guarantee that the initial dream would evolve into a beautiful, fully functioning watch, and you may get some idea of the magnitude of the project. While LM Perpetual shares most of the design codes with previous Legacy Machines, including a round case, a high domed crystal, and that prominent suspended balance, it differs in that busy complication-filled dial. On the dial side, Legacy Machines to date have been the exact opposite of LM Perpetual in that there was absolutely nothing − except the regulator − displayed above the movement’s mainplate (which looks similar to a full dial), except the absolute minimum necessary for the indications. Now here comes Legacy Machine Perpetual with not just a couple of animated mechanisms above the mainplate, but a complete complication. This radical − and such a change dial side is radical − approach would not normally work because . . . you may remember that I began this article saying that I was “conflicted” in many ways. Well, I don’t think I’m alone in liking MB&F because it is so different, but I am quickly upset if it actually does something differently. The reason that I think that Legacy Machine Perpetual gets away with a 180-degree change in dial direction is that it is such a beautiful and seriously groundbreaking complication. What a shame it would be to hide it under a dial. Especially as legibility, which is a problem for many too-busy perpetual calendar displays, is quite good thanks to those high-contrast blued hands over the white subdial rings. 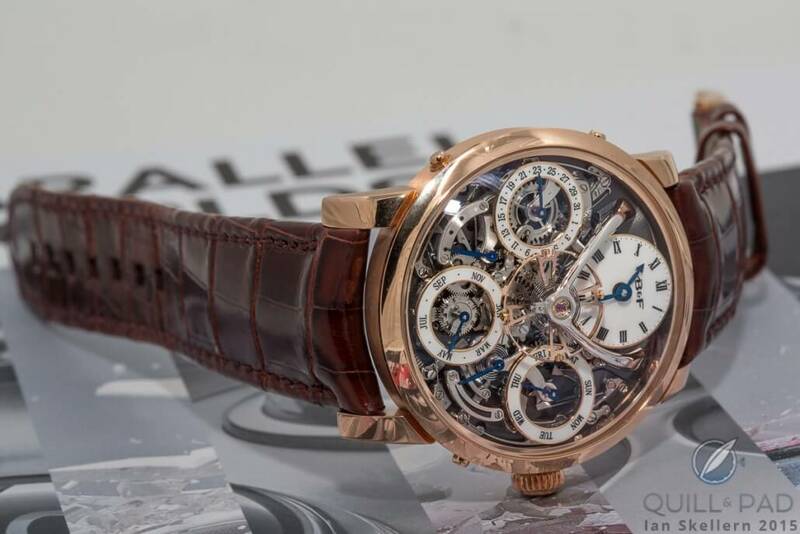 My guess is that there are likely to be future versions of Legacy Machine Perpetual with full dials, and I have no doubt that they will look resplendent. But personally I like Legacy Machine Perpetual just the way it is. The reward for MB&F with Legacy Machine Perpetual is not just that it has one more great watch to add to the brand’s already extensive portfolio, nor that the experience is likely to lead to future horological revolutions, but that MB&F now joins the ranks of the few elite brands with both the creativity and capability to offer something truly new in horology. MB&F used to describe itself as being based on tradition, but not constrained by tradition. Legacy Machine Perpetual is proof positive that that statement now applies to the watchmaking as much as the watch design. Legacy Machine Perpetual is one of those rare timepieces that makes all that came before it look obsolete. For more information, please visit www.mbandf.com/lmperpetual. In case you missed it, you may enjoy Is Independent Creative Horology Dead? 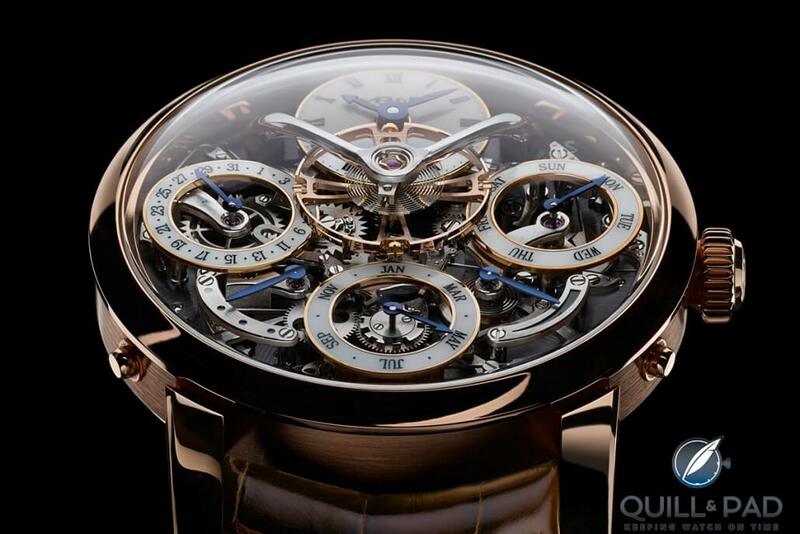 Such beauty and usefull perpetual complication. Why don’t you mass produce to to make it affordable to masses? Now it is just to read about and admire the photo. Hello Rashid, we’re glad you like the new Legacy Machine Perpetual by MB&F. Unfortunately, mass-producing such an incredible timepiece would make it into a fully different item. It would no longer be the work of art that it currently is. And I highly doubt that would ever be MB&F’s intent. For most of us, owning such a beautiful piece will remain a dream, but one whose quality we can really appreciate. I noticed that a lot of people apply the term “work of art” when describing watches made by independents. While it’s certainly true that many of them are fine timepieces, I think it’s a bit exaggerated to call them art. Firstly, all brands create watches that, in their opinion, they can sell, so it`s basically just business. Some, like MB&F might come up with interesting designs, but their core preoccupation is to sell their products. Thank you very much for stating your view here, Marius. I may disagree, but I appreciate your viewpoint. Strongly agree with your assessment here, Ian — this one is a real winner and takes MB&F to another level entirely! I very much enjoyed your article Ian. Thank you kindly. I was immediately taken with this watch when it first saw it and was fortunate enough to be able to acquire the platinum model. I have not yet worn it; I have been saving it for a special occasion. I sure do look at it a lot though! Thank you again, Ian. Great write up. Thank you for your kind words, Ed. I am curious to learn what event you will choose to wear it for the first time.